The Hammer Museum announced the artists participating in Made in L.A. 2014, the second in an ongoing series of biennial exhibitions focused on work created by artists in the Los Angeles region. Made in L.A. 2014 is organized by Hammer chief curator Connie Butler and independent curator Michael Ned Holte. The exhibition will be installed in every gallery of the museum and debuts nearly all new painting, installation, video, sculpture, photography, and performances created specifically for the exhibition. There are 11 major new commissions for the exhibition and every artist has received an honorarium. 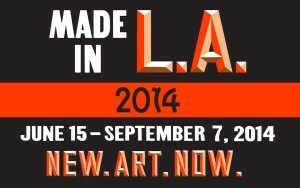 Read more about Made in L.A.